Dealing with a metamorphosis of secondary imagery; this exhibition manifests works which are both a homage and mischievous intervention. The images and objects have been playfully interacted with, and are then re-presented, extended and mediated; culminating in new interpretations. 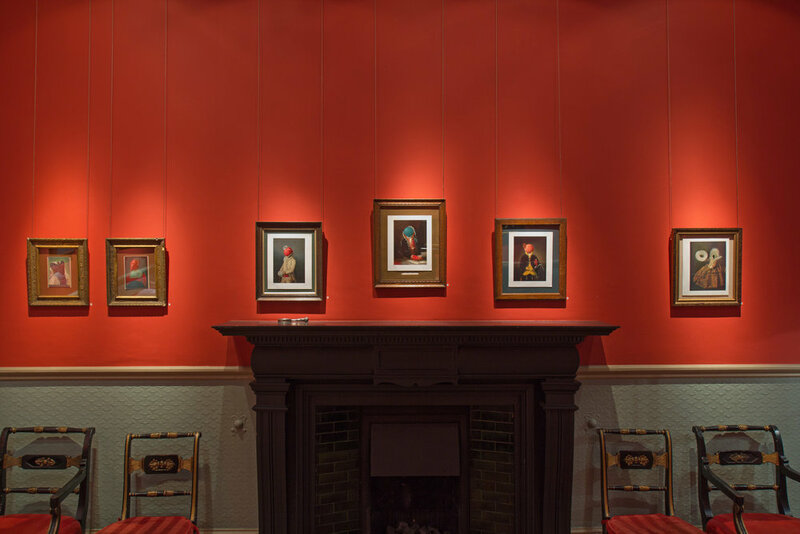 Upstairs at Gallery 286 is a traditional living room, with rich red walls, picture rails and elaborate mouldings. Within this space are hung works from ‘Taking Liberties with the Masters’ series. A collection of works where Bookpages and Postcards of Old Master Paintings have been intervened on with oil paint and are then re-presented in antique frames. The artists that have been ‘intervened’ with are all artists that I admire for their technical skill and craft. I tend to remove or cloak the faces and hands of the portraits and instead concentrate on extending/subverting the folds of cloth, lacy ruffs or ribbons to create new images with new connotations. 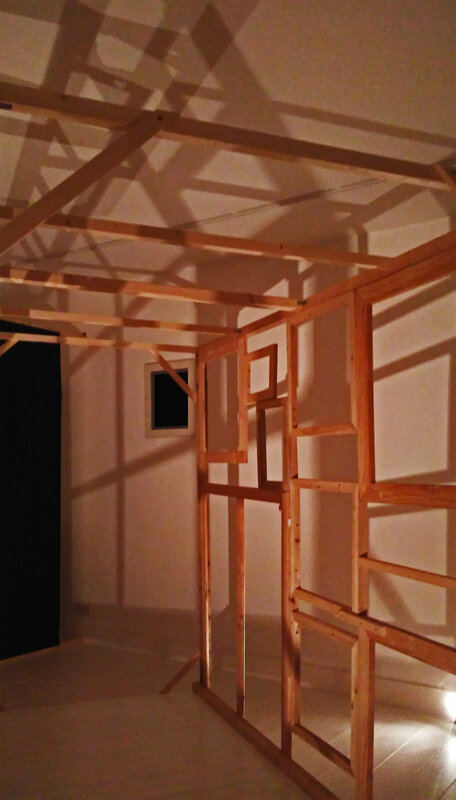 Downstairs at Gallery 286, the space is a contemporary ‘white walled’ gallery space; within which I have inhabited a ‘room’ construction; formed of old stretcher frames; which once lit, form a further shadow room. The visual illusion of frames joined together references the ‘Salon Hangs’, when paintings were hung floor to ceiling in the Academies. A wall of 'blacked out' paintings divided the space into a corridor, opening to reveal the large structure of 'Salon Hang' - A moving room, constructed from stretcher frames, lit in such a way as to extend over the entire room. 'When you are an artist you can play games with your own work, but when it enters a museum you are not allowed to change it.' Susan Hiller. The Black Wall/Obstruction has been created from blacked out old paintings. Rather than a destruction or defacing, it is a positive reincarnation of the works. Marking a point in time and an acceptance of the past. The frames screwed together form an almost perfect square. Their surfaces offer glimpses into their former life. The textures of the surfaces unwittingly echoing the surface of the 'Malevich Square', now craked to reveal its white underbelly.